Our large and varied stock now consists of an extensive range of items predominantly from the 20th Century. 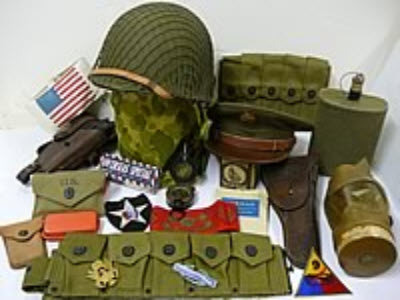 We stock general WW1 and WW2 militaria of the main combatant nations, including combat equipment, uniforms & clothing, personal kit, paperwork, insignia, helmets, caps and boots,, bayonets & military knives, deactivated weapons, respirators, aviation and naval items! We also, occasionally, have post WW2 and modern militaria as and when it turns up. All of our items are original and authentic to their period unless stated otherwise and carry a Money Back Guarantee. We hope you will find something of interest to you. 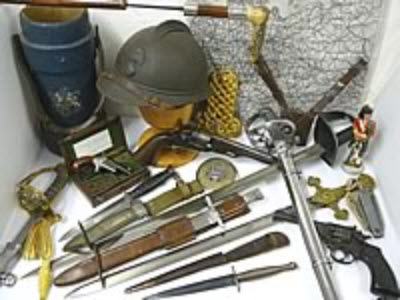 We have operated an efficient and reliable mail order service for nearly 40 years, originally dealing through a printed catalogue, but, taking advantage of the advances made in selling on the internet and communications, we now have this extensive website which is based on our currently available stock of Militaria. The design of this website, which includes many features unavailable on other sites, allows us to update it more frequently and offer an even better service to ALL of our customers, old and new, wherever they may be.